She grinned to him and nodded and wrapped her arms around his neck and nuzzled. Whispering to him as she straddled his lap not moving to head for that shower just yet. "Honey that could have been an offer for anything you want it to be an offer for." She looked then to the box seeing it was glowing and it puzzled her greatly. She picked it back up and studied it before trying to open and seeing what her mystery box was hiding from her. Isah couldn't help but grin when he heard what she said. He would be more than happy to join her in he shower. Though, eventually, they would need to end the fun long enough to eat. But he was still looking forward to it. He looked at the box again when she picked it up. "The pentacle on top is the Celtic symbol for the Goddess. You have Celtic blood and the blood of a Goddess. Could that be why it glowed when you, well after you put it down?" He didn't really know too much about the Celtic symbols, but he knew enough to know that one. He had to under the circumstances. She also had French blood. And a few other things that made her the woman he loved. But the box was Celtic and apparently enchanted or had some kind of spell or casting on it. Which would explain it not glowing or even opening for anyone else. But Isah truly was a novice in this. He only knew what he needed to know to do his job. He really wished he could be of more help to her. She sighed softly knowing full well what that was going to mean. Setting the box down she laid a hand on his chest and smiled sweetly to him. This was going to be a tough request for her to make but she had a feeling that She was the only person that could tell her about this box and its contents before it gets opened. "Honey...would you do me a huge favor? If you can ask her what this is all about I would be forever in your debt." She smirked and started to show him just how she intended on repaying him for this favor. Kyra was sure he would have agreed without all of this but she enjoyed it just as much as he did. would just open it. But it was better to be safe than sorry. "Sure honey, I'll ask ..." He reached to the nightstand for his phone, but she started showing him how she would repay him for the favor. He managed to get his phone. But he was definitely distracted. He got the phone flipped open and moved it so that the box was in frame on the camera. She was making a huge smile spread across his face. He managed to snap the picture. The only thing he could think to type was a few question marks before he hit send. He put the phone on the pillow and began to let himself get distracted with her. It was about five minutes before his phone rang that he had a text message. He reached for the phone and flipped it open to read the response. "Been looking for that. It was stolen about fifteen years ago. Where was it? Nevermind, not important. Give it to Kyra, if she can open it she can have it. Would be her's eventually anyway. It's harmless, promise." He Looked at her to see what she wanted to do about the box. She continued her efforts while he took the picture and waited for a response to it. Seeing the response made her all the more curious about what was inside of the box and why it would have been stolen so many years ago. She looked at him curiously and sighed softly before straddling his lap and having some more fun torturing him all in the name of pleasing them both. Taking the box she tried to open it again hoping she had some luck to see what was inside of it as she was curious now. "Guess there isn't a manual or instructions on how to open it huh?" She was still trying to open it but had a feeling she was doing it all wrong. She was searching and looking all over the box to see if there was a secret to the mystery box. Isah watched as she spoke while holding the box and the light began to emanate from between the lid and the base. It was cracking open to the sound of her voice. But it wasn't quite open yet. "Maybe there's a magic word. It seems to like your voice." It was the best idea he could think of. Maybe if she said the right word. "What might she have used as a password?" He wasn't sure how much help he could be in that area, but he would try. Kyra looked at the box confused and thought a moment shrugging at his question but tried anyway it was worth a shot. "Well maybe she would have used Krownar or Dreconis or Darkmane or Dragonis-Darkmane." She paused after each of those names to see if maybe it would unlock the box but she was absolutely confused at why it liked her voice. Until recently no one knew she existed but her mother. Sighing she waited to see what was going to happen with this box and what was inside of it. Vocal patterns were inherited. There could be just one little hint of an accent to Kyra's voice, or one syllable of pronunciation that was like that of her Grandmother. But it's also possible that the box just thought she had a pleasant voice and knew that she was not a danger or that it would be safe in her care. One could never know when it came to the spells cast by her Grandmother. Isah saw how the box liked her, it glowed brighter each time she spoke. "Maybe it just thinks your voice is beautiful. I do." She had chosen some good words, evidently. There was one click when she said Krownar. Then there was a second click when she said Dreconis. With each click, more light showed through from under the lid. It was going to take more words. "It sounds like it's a combination lock or a series of words. Um, what about your Great Grandparents?" He knew their names, he just couldn't quite remember them at the moment. Did Kyra even know them? She sighed and nearly through it but she vaguely remembered hearing her great grandparents name once before and thought for several moments before speaking the names hoping she remembered correctly. She took a deep breathe and tried spoke as evenly as she could. She was nervous that she wouldn't be able to open the box but even more nervous to see what was inside of it. She waited now to see if it would open up or if it was needing more names. She was holding it a little away from as if a snake was going to jump out and bite her. There was a third click when Kyra said Phillip, and a fourth when she said April. The combination was Phillip, April, Krownar, Dreconis. Though, as long as all four names were spoken then the box would open. Provided that the box recognized the one holding it. Which begs the question, how did the box recognize someone who hadn't even been born when it was sealed? She was holding the box, so she was leaving DNA. And she shared just enough genetic markers with her Grandmother for the box to know she was a descendent. So when she spoke, the box reacted to her. And when she spoke the right words, the box opened for her. Isah watched as the box popped open. Kyra would have to lift the lid of course. But the box was unlocked. And the glowing light dissipated. So all that was left to do was open it and see what was so precious that it needed DNA and a vocal code to open it. Isah's eyebrows raised as he waited to see if she was going to open it. "Good memory. I know how little they're spoken about, so for you to remember is impressive." He thought he'd throw that in. If Kyra opened the box, she would see that it contained a piece of black velvet. 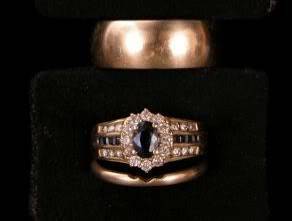 And set into a sponge, also covered in black velvet, was a set of three rings. Two were simple gold bands. The other one contained sapphires and diamonds. It was Phillip and April's wedding rings. Venis had taken possession of them the day she buried her parents and burned the village she had been born and raised in to the ground. April had died, and Phillip killed himself on her grave. He was in possession of all the rings at the time. So Venis kept them. The rings had been placed in that box and the code had been changed many times over the decades. But the code that Kyra used had been put in place shortly after she found out about Dre. While they were at The Society of the Blood Rose. The box had been stolen a few years before Venis inherited the Keep from that cursed Fallen Paladin. The one who's soul she tore in half and sent half to hell and half she wore in a amulet around her neck on occasion. So how the box had ended up in the catacombs here was a mystery. But now the box was where it belonged, and the treasures it held were safe once again. Kyra would have inherited the rings at some point. After all, she had already been given April's favorite gown. So it was good that she was in possession of them now. And if Kyra took the rings out of the box, she would find that Phillip's ring was inscribed with April loves Phillip. And April's Engagement ring was inscribed with Phillip loves April. An eternal testament to the love that had started the family tree that helped bring Kyra into the world. And it was proof that even a warlock could have some good in him. Isah patiently waited to see what Kyra was going to do. Kyra smiled softly at his compliment and hesitantly opened the lid of the box uncovering the rings. She sat there in awe of them and was speechless at how beautiful they were. Running her fingers over them lightly as she picked them up and looked at them closer even seeing the inscriptions on them. "These are beautiful...they must have really loved each other." She held them out so Isah could see the inscriptions on them and had to smile. She sighed softly before placing them back into the box and thought that some day she may use them too. Closing the lid she held it in her lap and curled up close to him before leaning up to kiss his lips. "Thank you for showing this to me and keeping it safe." She went quiet and spoke out in her head to the last person that would expect to hear from her but not much was said just something simple. She continued to sit there silently as she placed the box on the table next to them and let herself be wrapped in his arms. ... The sword pierced the flesh of the dark mage and slid between two of his ribs. Through the lung and into the heart the sword continued as it was pushed rapidly by the Goddess. As the sword was half-way through the heart Venis paused. There was a voice in her head that had not been there in a very long time. It was her beloved Granddaughter. How did she get through? Venis had blocked everyone out. Well, all the usual suspects anyway. She had never thought to block out her Granddaughter. She had turned off her phone after a text from Isah had told her that it had been on. The words brought a smile to Venis' lips. The smile reached all the way to her eyes. So the sparkle in her blue eyes would be the last thing the dark mage saw. ~You're welcome sweetheart. I know you will. I love you.~ Then with a final thrust, she finished pushing her sword out the back of the dark mage's body. Then she slid him off the sword and turned around to continue with the battle at hand. The rings were quite beautiful. Isah couldn't help to think about what great taste Phillip had. "It takes a great love to overcome what they had." He, of course, was speaking of the fact that Phillip had been a lover of the dark magiks, a warlock. And yet he fell in love with, married, and had a child with April, a white witch. He watched her examine the rings and put them back in the box. "You're quite welcome honey." He was glad that the box had contained something pleasant. It would have really sucked if it had been something nasty. He did wrap her in his arms. He loved having her there like that. And he held her in silence for a little while before he spoke again. "Should we get cleaned up and go to dinner?" They had spoke of it earlier. And now he was just a little hungry. Though, he couldn't help thinking about how lovely those rings would be on Kyra's finger. The voice coming back in her head was heard but not acknowledged and the link was cut off. It was unusual for her to reach out like she did but she felt it was necessary to do. Snuggling closer to Isah smiling softly at the thought of those rings being on her fingers but she wasn't looking for that to happen ever though. Looking up at him she grinned at the mention of dinner. "Yeah I think dinner sounds good now." She wasn't going to admit that she was starving now. Getting up she moved over to the dresser and found a brush to fix her hair before she went to find some clothes. "Honey didn't you say I had some clothes some where?" She waited to see where those clothes were and see if there was something in there she wanted to wear tonight. He smiled when she said that dinner sounded good. He was very hungry himself. When she got out of bed he followed. "Clothes are in here." He walked over to the closet and opened the door. Then he walked over to where she stood at the dresser and leaned down to give her a kiss. "Honey, I'm going to take a quick shower." Then he walked off, still very undressed, hoping she enjoyed the view. She smiled back at him and nodded to where he walked to and then watched him walk away. Kyra liked what she saw for sure and decided she also needed a shower before they left. She walked in behind him with a grin. If he did she would wait her turn but she was hoping he wouldn't so she waited to see. Isah had turned on the water and stepped into the shower. He was slightly caught off guard by the soft sound of her sweet melodic voice. He turned around in the dark cavern that was his custom made shower. He reached up to the bar that held the shower curtain and used the rings at the top of the curtain to pull it open for her. "Honey, you can join me any time you want." He grinned wickedly. He stepped backwards into the water, the shower head barely six inches above his own. He let the water run down the back of his head and over his shoulders. From there it poured down his pectoral muscles to his washboard abs. He had a full on six pack now. 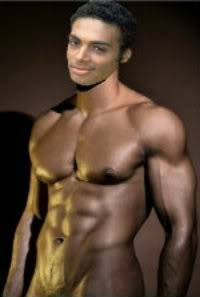 The gym was a wonderful thing. She grinned seeing she startled him and grinned even more seeing his shower when he opened the curtain for her. She stepped in with him and ran her fingers down his chest staring up at him. "Mmm I like that offer honey. And I might just take you up on it often." She leaned up on her toes and kisses his lips feeling the water roll over them. Kyra wrapped her arms around his neck enjoying being so close to him and wondering if they were ever going to make it to dinner at this rate. Isah pushed the curtain back in place once she was inside. And when she leaned up on her toes, he bent to meet her half way. When her lips brushed his, he moved to make them linger. He pressed his lips harder against hers using them to part her own. Then his tongue slid into her mouth as he wrapped his arms around her and lifted her into his arms. He moved to place her back against the side of the shower and he held her there with his body pressed to hers. He broke the kiss and looked into her beautiful eyes. "Remember when I grabbed you up out of your doorway and covered you to shield you from the blast of doors flying open everywhere over at the Tel?" He was feeling a little nostalgic for some reason. He was remembering all sorts of things. But he wasn't going to remind her about why the doors had flown open all over the Inn. Kyra squealed a little as he lifted her his arms and continued to kiss him. Their tongues toying with each other as her arms wrapped around his neck a little tighter holding him close to her. She smiled to him as he held her against the shower wall. "Hmmm a little bit but not so much." She laughed and was trying desperately to remember back but it wasn't coming to her. She bit her lip some more and stared into his eyes. "Care to remind me about that memory of yours?" She was quite interested in hearing it and be able to enjoy the memory with him. Isah chuckled and placed a gentle kiss upon her lips. "It was Christmas Eve. I was hanging mistletoe above all the doors in the Inn. We had just barely met a few days before, which I remember as well, and I saw you peeking out of your door to see what was going on." He grinned because as he reminded her, he remembered even more clearly. He had a twinkle in his eyes from the smile as he continued. "I asked for a hug, even though tradition is a kiss. You asked why and I told you about the history of mistletoe. Then Bo or Andrew, I forget which, told me to get you away from the door immediately. I snatched you up in my arms, and you started punching the hell out of me. I set you down in the hall and covered you as much as I could to shield you." He placed another chaste kiss upon her lips. He was still all smiles. "After the doors blew open and the wind died down, I moved to let you up. You yelled at me and asked me why I didn't take you into your room if I was trying to protect you. But a gentleman does not enter a ladies room uninvited. But you were still mad at me for it." He kissed her again and let his mouth linger over hers as he whispered. "And that was the moment that I knew." She laughed listening to him barely remembering that day and thought about other days where things happened and the thought of those days made her a little sad. She was so young and stupid for a lot of the things she did not only to herself but to him and others. She has grown up quite a bit since those days and feels more sure of herself now where she didn't before. She returned the kiss and continued to listen to him. "Well I am glad you protected me and were such a gentleman. I can appreciate that now. But umm what did you know in that moment?" She waited to hear what he has to say she enjoyed listening to him. Isah couldn't help but smile wider before he answered her question. "That, even though you told me Dre was your father that day, I wanted to spend every day trying to spend every possible moment with you for as long as you could stand to have me around. I love you Kyra Dragonis-Darkmane." He waited a moment in case she had anything to say. Even though he had said those words to her before, he never expected her to say them back. And just because she had said them before too, didn't mean she still did. So if she didn't love him too, he didn't want her to lie to him and say she did. Either way, it was up to her. Then he pressed his lips to hers and let his tongue slide into her mouth once more. She smiled brightly and hearing those words made her heart melt and beat faster. She knows now that things she did the running parts were because she was scared to let him love her and that she was falling in love with him. Her and her mother spent a lot of time analyzing a lot of her life and it all came back to this one man making her crazy. She knew she didn't want any others in her life just him for as long as he wanted her there. "Well I didn't know it then but I do now...I love you more than words can even possibly describe to you. And I'm sorry for all of the things I put you through over the years. You've always made me crazy and I never wanted to admit that I was falling in love with you." She bit her lip and hugged him realizing she just admitted to him what she wasn't sure she ever could but she did and she was so happy about it. Her words were music to Isah's ears. He kissed her deeply and passionately. The kiss led to other things, and about an hour later, they emerged from the shower. Isah was all smiles as he handed her a towel and began to dry himself with another. "I think we should get dressed and go to dinner honey." He chuckled. He held the bathroom door so that she could leave the bathroom ahead of him. The thought occurred to him that if they tried to get dressed together, they might not make it to dinner for another hour or longer. "Um, I think I should get dressed in the bathroom. That way we can be sure that we make it as far as getting dressed. I think if I go in the bedroom with you to get dressed, I might get too distracted again." He smiled and then went to grab some clothes.